They’ve come up through Chestermere Minor Hockey and reached the elite levels, and now they are hoping to help the next generation do the same. 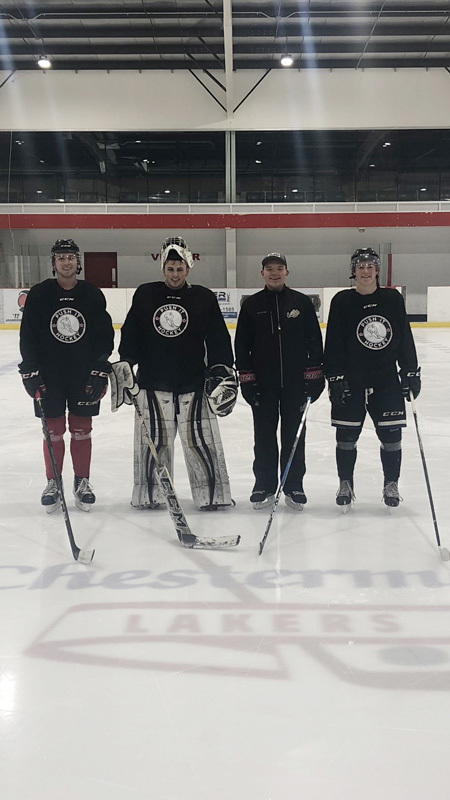 Four of Chestermere’s best teenage hockey players are joining Reid Hnatowich’s Push It Hockey for a camp Aug. 10-12 at the rec centre. There will be five on-ice sessions plus five drylands sessions over the three-day camp. The bonus is the likes of WHLers Tarun Fizer, Kyle Crnkovic and Matthew Quigley, along with goalie Nolan Kent — who just signed on with Northern Michigan in the NCAA after a stellar tenure with the Spruce Grove Saints of the AJHL — have all signed up as instructors. The camp will have groups of 20 for novice and atom players, who will get all the motivation they need if they aspire to be an elite hockey player one day. “What’s cool is they’ve been through this and done it,” Hnatowich said about his foursome of coaches. “Each of these guys has grown and developed in the game through a different way. Fizer just finished his first full season with the Victoria Royals, where he played in 45 games and another 11 in the post-season, and he will be looking to take his game to the next level as he is only 17. Crnkovic, 16, was called up for three games with the Saskatoon Blades this past season but the first round draft looks for big things in the next few years. Quigley, 19, has become a stalwart on the Portland Winterhawks defence with two solid seasons, and he’s an important member of that team. Kent, 19, had the most success out of any of them, as he led the Saints to the AJHL championship. Both Quigley and Kent are working with Push It Hockey all summer, and the camp will be a last hurrah before they head out for the fall season. Hnatowich says had no trouble getting the four players on board. “Nolan was the mastermind behind this,” Hnatowich said. “He wanted to get out and do it. He wants to expand his coaching experience. As soon as he brought that idea to me, I said let’s get everyone involved and make it a way to give back and help out the local talent. Registration opened this week for the camp, and it will remain open until the weekend of the event, but there is a limit of 20 kids for each of novice and atom. While the coaches for this camp are just teenagers, Hnatowich is only 21 himself. After suffering a severe concussion during his 15-year-old season, he went into coaching instead of trying to continue playing due to the health risks. He’s spent time with the bantam triple-A team in Airdrie, the midget triple-A team in Strathmore and this past season joined the Okotoks Oilers of the AJHL. He’s been working with Chestermere players through Push It Hockey the past few seasons and has found his calling.